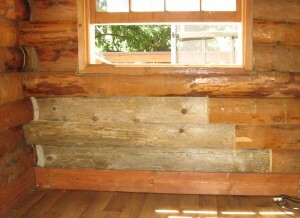 How do you know if your log home has rotten logs? One method is to knock on the logs. This method is not always a fool proof way to locate rotten logs, but it works 90% of the time. The healthy logs will sound solid. If there is a hollow or soft area in the log, you will experience a noticeably different sound. Don’t forget to tap on the logs directly below the windows. This is one of the first areas to show signs of rotting. Looks can be deceiving, because even though the exterior of the log appears solid (pic- above right), the interior may be in decay (pic-below left). Log ends are also common areas for log rot, especially if they stick out past the overhangs of the house. Excessive checking, or cracks, may be an indicator that the log is starting to decay. Once a problem log is located, place a piece of masking tape to mark it for repair. DO NOT start tearing or digging out the surface of the log to determine how deep the rot has gone. This is the point to call in a professional. Once the rot has started, it goes through several stages. Fungus may begin to grow either on the outside or the inside of the log, often leaving a hollow cavity. If the decay has not progressed to the point where it structurally affects the log, the log may be treated from the inside out, restoring the structural soundness and preventing further decay. This also allows the exterior of the log to remain intact, and therefore, keep the overall consistency of the home’s aesthetics. If the log cannot be saved, it must be removed and replaced. This involves shoring up the wall, systematically removing the rotten log and replacing it with a new log (pic-right). The nearby logs are then treated to prevent any spores from spreading to previously undamaged logs. If a log needs to be replaced, Alpine Blue is able to match almost any log profile. The next step is to stain the log in order to get as close as possible to the original patina. Maintenance is not one of the more glamorous aspects of log home ownership. Fortunately, with planning and vigilance, you can keep your investment beautiful and secure with little cost and effort. Simply by ensuring that the proper stain and application method are used and regularly maintained on your log home is the best defense for avoiding these types of log repairs.